An enjoyable western diversion off the main drive between Ilford and Bylong. Lake Windamere, Mudgee wineries, cafes and galleries, Munghorn Gap Nature Reserve, Bylong Valley. From the small village of Ilford, continue north on the Castlereagh Highway. But after 2km, instead of turning right towards Rylstone on the main drive, continue straight ahead. About 15km on, the highway runs along the western shore of Lake Windamere and then follows the Cudgegong River through several small towns to the large centre of Mudgee, 52km from Ilford. This is a great base to explore the productive local countryside, with its excellent wineries, as well as the cafes and galleries of the town. Leaving Mudgee, drive north on the Ulan Road, 10km to the village of Tahmora. The Wollar Road (part of the Tablelands Way) then leads 39km through Munghorn Gap Nature Reserve astride the Great Divide to Wollar. 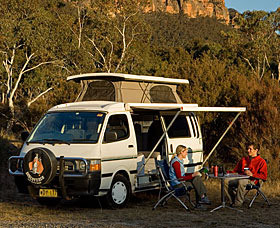 The reserve is like a small outlier of western Wollemi National Park, with a grassy picnic area beside the road, dry woodlands, sandstone outcrops and a half-day walking track to Castle Rocks. The area is renowned for its birdwatching, with a mix of eastern and western species. From Wollar you can also explore Goulburn River National Park to the north, but the trail continues eastward on the unsealed road through the expansive Bylong Valley - which flows to the Hunter River. After 11km the turnoff to Lees Pinch Lookout (a good diversion) and Cassilis is passed on the left. It is another 14km to the junction with the Bylong Valley Way on the left. Here you also rejoin the main drive. Continue straight on along the Way for 2km into the tiny village of Bylong for refreshment. From Bylong, you can go back east along the Bylong Valley Way to continue with the main drive into the Hunter Valley, or you can continue south along the Way, through Rylstone and back to Ilford.